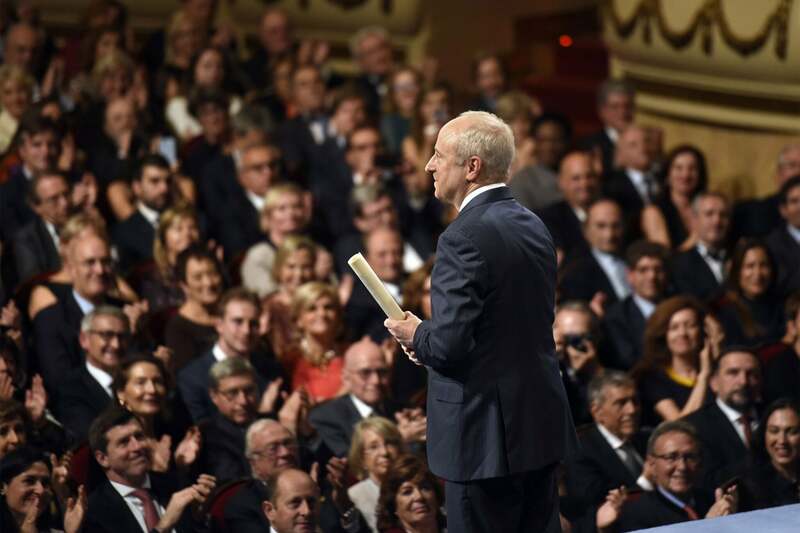 In a ceremony last month in Oviedo, Spain, King Felipe VI presented Harvard political philosopher Michael Sandel with the 2018 Princess of Asturias Award for Social Sciences. The Asturias Awards, the most prestigious in the Spanish-speaking world, recognize outstanding achievement in eight categories, including science, literature, the arts, and concord. Sandel, the Anne T. and Robert M. Bass Professor of Government, received the award along with filmmaker Martin Scorsese (Arts), Swedish geneticist Svante Pääbo (Science), and oceanographer Sylvia Earle (Concord). Sandel’s books — on justice, democracy, ethics, and markets — relate the enduring questions of political philosophy to the most vexing issues of our time and have been translated into 29 languages. The award ceremony, held in the resplendent Belle-Époque Teatro Campoamor, was televised live on Spanish national television. Cheering crowds serenaded by bagpipe players in traditional garb lined the streets of Oviedo, a regional capital in northern Spain, as the laureates and their royal hosts made their way to the theater. In his speech accepting the award, Sandel explained how his interest in political philosophy came late, during graduate school, and grew out of a long-standing fascination with politics and economics. “What attracted me to philosophy was not its abstraction but its inescapability, and the light it sheds on our everyday lives. Understood in this way, philosophy belongs not only in the classroom but in the public square, where citizens reason and argue about the common good,” he said.